Dr. Battig grew up in Salem, and attended Brigham Young University where she received a BS in general science. She received her doctorate of veterinary medicine from the Oregon State College of Veterinary Medicine in 1985. After working as a State Veterinarian for greyhound and thoroughbred race tracks, she moved to Fairbanks, Alaska in June of 1990. She worked for several years at other veterinary clinics in the Fairbanks area, as well as other communities around Alaska. In January 1998, Dr. Battig opened Chena Ridge Veterinary Clinic, which is still in operation in Fairbanks today. 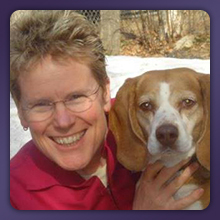 In 2002, Dr. Battig began her path of becoming a Board Certified Veterinary Dental Specialist, which had always been a passion of hers. She completed her extensive program in March 2011, and is excited to now be working as a Dental Specialist. Her recent move back to Oregon, along with the purchasing of the Animal Dental Clinic, has created the ideal setting for her. Her two dogs, Jessie Jane and Russel, are excited to be a part of the Animal Dental Clinic family as well.